Many organisms live together in ecological relationships whereby one organism develops a dependency upon another at some level. For example, a predator-prey relationship exists between red-tailed hawks and mice. Parasites, such as tapeworms, live in the intestinal tract of their host, robbing them of partially digested nutrients. A parasite benefits at the expense of its host. Although not necessarily pleasant to consider, most of us have follicle mites living among the hair follicles of our eyelashes and eyebrows. The mites have a home, but we are neither benefitted nor harmed. This type of relationship is commensalism. An ecological relationship whereby both organisms clearly benefit is known as mutualism. When organisms in a mutualistic relationship become totally dependent upon each other for survival, they may share a similar biological fate and cannot survive outside the relationship. Organisms with such an intimate relationship are said to have "coevolved." Yucca plants, so common a feature in the landscapes of the Llano Estacado and Trans-Pecos, and a small (about an inch in length and wingspan), pale, virtually non-descript moth represent a textbook case of coevolutionary biology. Yuccas do not have the ability to produce seeds without the moths. Yuccas, as so many other plant species, can clone themselves from the base of a parent plant, but without seed production, genetic variation is greatly restricted. Likewise, the yucca moth is totally dependent upon the yucca plants: yucca moth caterpillars feed only upon yucca seeds; otherwise, they will starve. There are many different species of yuccas native to the arid regions of North, Central, and South America, and the Caribbean; each is pollinated by some species of yucca moth, often referred to commonly as pronuba moths. Tegeticula yuccasella (there is no common name for this particular species of moth) is the only species of true yucca moth found east of the Rocky Mountains in North America, and is solely responsible for pollinating all eastern species and many western species of North American yuccas. In the spring when yucca flowers are in bloom, yucca moths are enticed to visit the flowers by their fragrance. Male and female yucca moths mate within a yucca flower in the evening after the flower has fully opened. 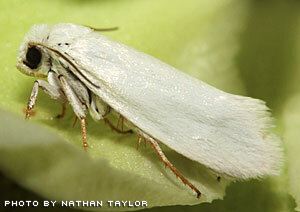 It is only the female moths, however, that pollinate the yucca flowers. From dusk to around midnight she will collect sticky pollen from the yucca's anthers with her specifically adapted mouthparts and form a "pollen ball," tucking it under her thorax. She will comb pollen into the stigmas (the pollen receptors of flowers) of the various yucca flowers she visits. Without this pollination by the moth, the flowers would not produce fruit and seeds. (In other parts of the world where yuccas have been introduced as ornamentals, they do not produce seeds because the yucca moth family is found only in the Americas). 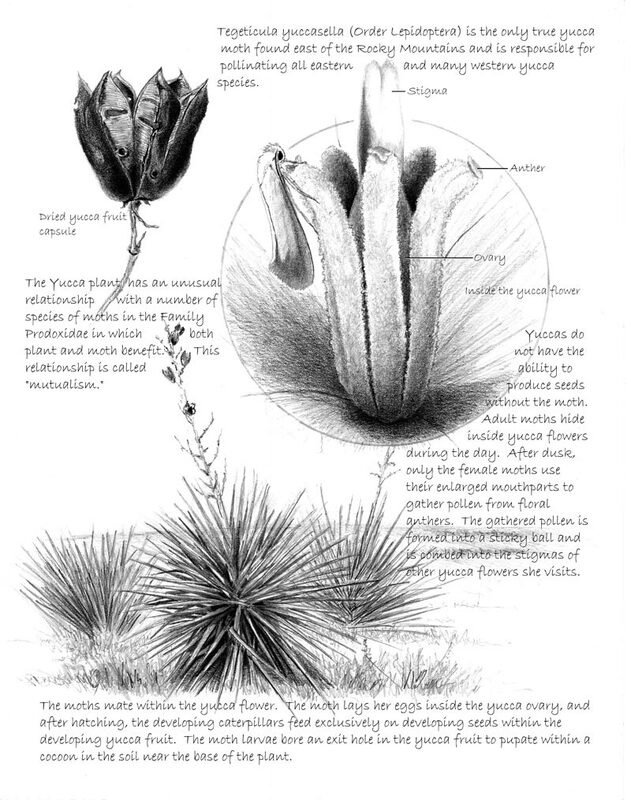 A yucca flower's ovary contains eggs located within three chambers called carpels. Each carpel is further sub-divided into two smaller chambers called locules. When a female yucca moth visits a yucca flower for pollination, she will also back up to the base of the yucca flower's ovary and insert a sword-like egg-laying structure called an ovipositor into one or more of the six locules to deposit her eggs. By the time the moth's eggs hatch into tiny caterpillars, the yucca flowers will have begun to develop their capsule type fruit with seeds as the only food source for the growing caterpillars. After feeding on yucca seeds for a time, the yucca moth caterpillars bore holes to exit the fruit, drop to the ground to the base of the yucca plant, and burrow a few inches down into the soil. In the soil the caterpillars form cocoons and pupate for several weeks before emerging as adult moths to renew the life cycle. No organism lives in isolation unaffected by other living things. Relationships between living organisms can range anywhere from being generally supportive of individual sustenance, as in the case of a hawk and mouse predator and prey, to the sublime, in which both partners in the relationship are totally dependent on each other for survival of a species, as we have seen with yuccas and their pollinating moths. Mystery in nature abounds; unquestionably, many of nature's relationships have yet to be discovered and described.